I was talking to my friend Marjie the other day about the Holiday Lineup set, and mentioned it would be the perfect set to use with the Paper Piecing Technique, I'm happy with the outcome of the card, but don't think I'll be adding it to my "make these cards for Christmas List", unless I can talk one of the boys into cutting out the pieces of DSP after I stamp them! Paper Piecing is a great way to use up the scraps of DSP that you save. 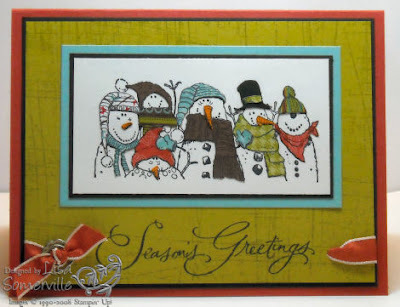 Here I used some scraps from my Holiday Treasurers and Ski Slope DSP, to add to my stamped image from Holiday Lineup. I also used scraps of black and orange card stock for the hat and snowman's noses. I stamped the Sanded Background in Kiwi on my Kiwi card stock, added my sentiment from Many Merry Messages in Black, and used my crop-a-dile to punch holes so I could add my Riding Hood Red Taffeta ribbon tied through my Silver Hodge Podge Hardware piece. Love the swirly sentiment and family of snowmen. A wonderful card , Lisa !! I just love your blog and hope you don't mind if i add you on my blogrol ..
Hi Lisa love your snowman. I am going to have to try paper it. Love your blog. Grat card Lisa! I really like the Ski Slope DP. hahaha! Good luck getting the boys to cut out all those little hats! WAY FUN card!!! super cute!